- Another August and another fun trail run with a great group of runners of all ages. 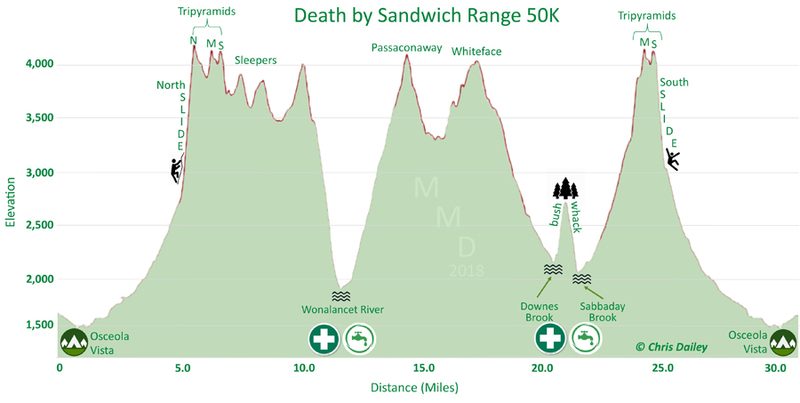 This year's course had us running through the Sandwich Wilderness over some of the more enjoyable running trails, along with two super steep one mile bursts mixed in, and a bushwhack to make things interesting. - Some runners started at 5AM, others at 6AM, while Ben, Jerimy, Nate and his dog Piper, Stas, Tim, and myself started at 7AM. - Stas was the rabbit for the first half of the run, he set off ahead of us setting a blazing pace through the Tripyramids and the Sleepers, we last saw him at the top of the north slide and wouldn't see him for awhile. The rest of us stayed together throughout the run while leap frogging from time to time. 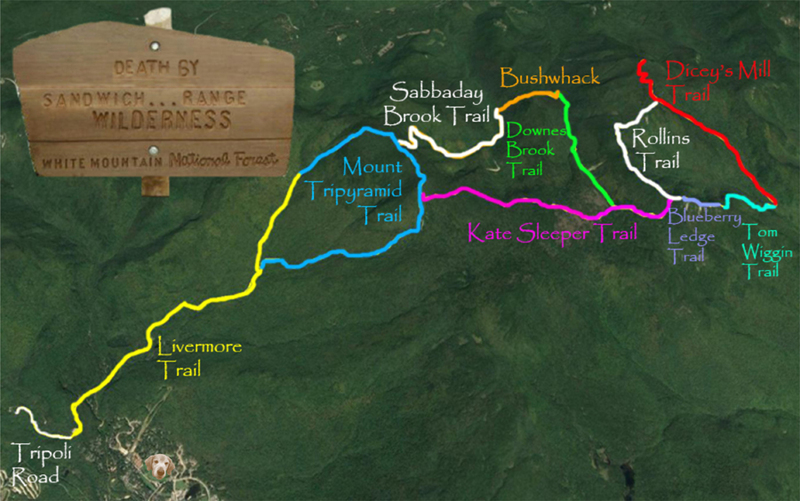 During the run, I would go a little faster on the downs (Tom Wiggins and leaving Passaconaway's summit), while everyone would catch me on the ups and pass me (Dicey's Mill), I'd settle in with the group during the minor up and downs (Kate Sleeper, Rollins). - The weather was close to perfect, so hydrating and fueling was not an issue, especially with two water and fuel stations at mile 11 and 21, many thanks to Todd, Alan, Levi and Katrina. - As we headed up Passaconway's summit cone we caught up to Stas and ran with him to the summit before parting ways as we reached the Rollins Trail. - I held my own most of the day over this very fast route, probably 75% was made for running/fast hiking, where last year's route in the Great Gulf and King Ravine was probably 10-15% runable! - When we reached the bushwhack section along the Downes Brook Trail we decided to stick together, the route was originally flagged but someone had gone in and taken down the flagging, they probably thought we weren't going to take it down once finished. It wasn't a bad whack but it was thick and scratchy but not a knife fight. It did slow us down quite a bit at first but then Tim got us on a good line and we made our way over to the Sabbaday Brook Trail. My original goal was to run a sub 8 hour but without the flagging I reset my goal to 8:15. - Once we hit the Sabbaday Brook Trail we all went at different paces. Ben went into over drive with Tim following along for a little bit before Ben pulled away. Nate and I struggled together up the steep last mile to the ridge, it was brutal but we made it! - Once back on the Mount Tripyamid Trail, Piper and Nate took an extended break so Piper could get some water, relax, and cool down before the steep descent on the open south slide. I continued on motoring down the slide. - I made great time down the slide but was unable to catch Tim over this technical section, once back in the woods the trail levels out and is built for speed so there would be no catching Tim on this day, but I was still thrilled with my time back down to the Livermore Trail and Tripoli Road finale. - I quickly made my way back to Osceola Vista Campground with four straight sub eight minute miles to finish strong and come in at 8 hours and 11 minutes, four minutes behind Tim and twenty-two minutes behind Ben, good enough for third! Click here for the whole photo album that has multiple contributors.